Creepy or incredible? 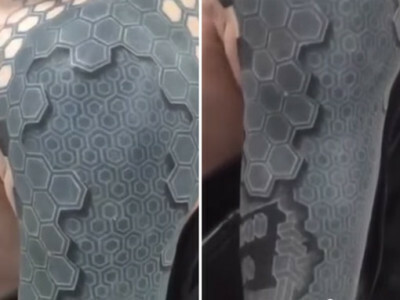 This 3D tattoo will make your head spin! Breathtaking and scary all at the same time. You won’t believe your eyes – and that’s probably the exact aim of this weird example of body art. Photographs of this bizarre work of art have spread around the world like a cyber fever. Ingenious technique and the three-dimensional effect make it look as if a chunk of flesh really is being cut out of someone’s arm. The optical illusion has already sparked a lot of controversy around the world. Some see it as a remarkable work of art, while others think it goes too far. Tony Booth of Dabs Tattoos in Southport in die UK is the mastermind behind the tattoo that‘s causing such a fuss. You can see it, together with other unreal designs, on World of Tattoo’s Facebook page.